« TNB Live Friday, March 6th! This week we have a special episode of TNB as we say goodbye to Phaelia from Resto4life. This is a special episode of Twisted Nether. As many of you already know, Phae from Resto4Life, will be closing her doors on March 19th. 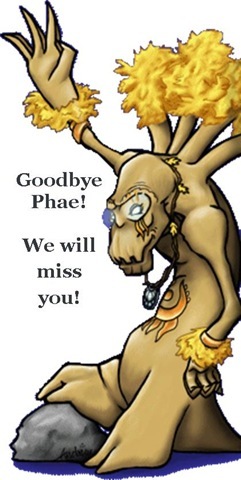 Tonight we want to honor and say good-bye to one of the most influential and well-known WoW bloggers, Phae has inspired many bloggers and with her grace and knowledge, not only helping solidify druids into a proud community but WoW bloggers in general. Whether through her extremely informative website, or her open and friendly discussions with her readers, Phae was not just another WoW blogger, she was a personification of the avatar she played. Intelligent, thoughtful and nurturing, Phae planted seeds within the druid community, uniting them first through the World Tree project, then extending her reach and calling all bloggers together under the Blog Azeroth tree. Providing not only a place for people to meet, but to exchange ideas, and helped, making all of us, druid or not, better. With her wonderful spirit, Phae as touched all of us in one way or another. We are so happy to have Phae with us for one last show, so please join us as we say good-bye. If it makes Phae any more confident about the name, my dads name is Colin, and he’s a small coastal fishing town man, from out the backwaters. Most definitely not a rich guy! Awww <3 you Phae, you’ve touched so many bloggers out there! Will still bug you on MSN every now and then! <3 Phae! Best druid blogger out there, and like everyone’s guide for druidism in the healing flavor. So sad to see you go…but that just means you an have a party for your comeback! I’m so sorry you left. Your site helped me be a better druid!